The Second Spanish Republic, proclaimed on April 14, 1931, started off with a lot of optimism. Among its most enthusiastic supporters were the Catalans, anticipating recognition of some form of regional autonomy. On the whole, the Basques and Galicians were less actively engaged with nationalistic aspirations at that time, but those who did harbour autonomous sentiment also advocated some special recognition for their regions. 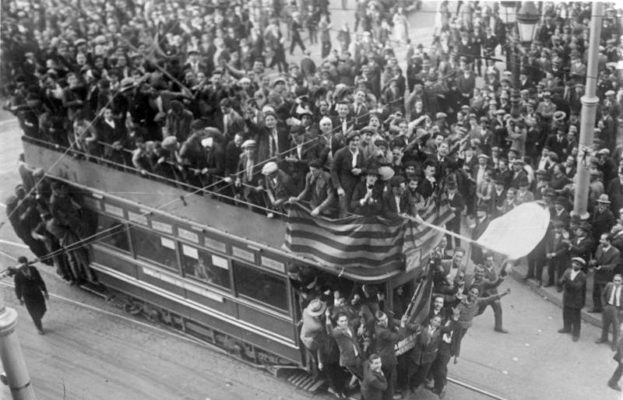 Proclamation of the Second Republic enthusiastically greeted in Barcelona. The three regions shared a historic sense of identity based on their own language, literature and culture. They also shared geographical similarity: as coastal regions their maritime traditions exposed them to international contacts either through their sailors bringing back news from elsewhere, or through visitors from abroad. Of the three regions, Catalonia had the largest population, and had played the most active and influential role in Spain’s history. It featured significantly as a Mediterranean maritime trading power during the 13th and 14th centuries but played second fiddle to Castile after the marriage of Ferdinand of Aragón (Aragón included Catalonia at that time) and Isabella of Castile in 1468. The 18th century was a low point for Catalonia when it was politically suppressed by the French Bourbon dynasty which succeeded to the Spanish throne in 1700. However, there were commercial compensations as South American markets were opened up to Catalonia for the first time. Things changed dramatically in the 19th century during which Catalonia underwent a major political, linguistic and cultural Renaixenca (rebirth). At the same time, the region carried considerable economic clout in Spain. It was Spain’s industrial engine despite being plagued by violent strikes, lay-offs and anarchist upheavals. Its textile industry was the fourth largest in the world, reinvigorating the entrepreneurial spirit that stretched back to the Middle Ages (Barcelona had a stock exchange, the Llotja, as early as the 14th century). Exporters and importers thrived, factories were built, and banks opened in an expanding Barcelona. In 1848, Spain’s first railway was built between Barcelona and Mataró, a coastal town 30 kilometres/18 miles to the north. The industrial revolution spawned large mansions built by Barcelona’s elite along the Ramblas. In sum, Catalonia was Spain’s most dynamic region and Barcelona its commercial and manufacturing flagship. Catalonia’s regional aspirations were advanced in Madrid in the early 20th century by two new political parties: the Lliga Regionalista (1901) and Solidaritat Catalana (1906), and by a special statute, the Mancomunitat (1914). The statute brought together Catalonia’s four provinces to form a regional government. Although its political powers were restricted to the region, the Mancomunitat played a vital role in protecting and promoting Catalonia’s linguistic, artistic and cultural heritage, financing libraries and museums, and supporting public works and agricultural and technical schools. The work of the Mancomunitat did much to advance Catalonia’s sense of identity but it was insufficient to satisfy those who aspired to autonomy if not separation. Several groups formed that were frustrated by the intransigence of Madrid, the most radical being the Estat Catala (1921-22). Its leader, Francesc Macià, a former officer in the Spanish engineer corps, advocated separation. That wasn’t to be. In 1923, General Miguel Primo de Rivera, with the consent of King Alfonso XIII, declared a military a coup. A committed centralist, Primo (in September 18, 1923), took aim at the cultural heart of the Catalans: the official use of their language was forbidden, instruction in schools was switched to Castilian, the Catalan flag lowered and the Catalan national dance (the sardana) prohibited. Finally, he dissolved the Mancomunitat. 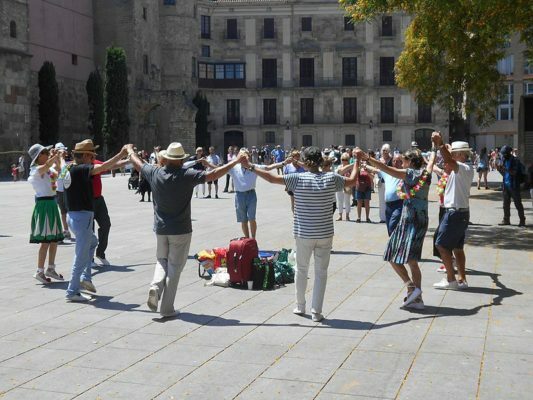 Sardana danced spontaneously in the Cathedral square, Barcelona. Primo’s dictatorship ended with his resignation and exile in January 1930. In August 1930, a dozen men representing different political persuasions (three of whom were Catalans, met in San Sebastian. Disenchanted with the monarchy and largely leftist in spirit, the group set out a number of proposals (known as the Pact of San Sebastian) beginning with the establishment of a Republic and a new constitution. Among the proposals put forward were freedom of political affiliation and regional autonomy. On April 14, 1931, the unpopular Alfonso XIII went into exile. On that day, the Second Republic was proclaimed. On that day, too, Macià –former leader of the separatist Estat Catala and now head of a Catalan coalition party, Esquerra Republicana– unilaterally declared Catalonia a Republic, albeit within a federal Spanish state. Given the recent history of Catalan aspirations, and the delicate moment of political transition, any declaration that smacked even slightly of independence had serious repercussions. Macià’s unilateral declaration caused great alarm in the provisional government in Madrid, and three ministers quickly went to Barcelona to head off a confrontation. An agreement was reached to resurrect the Generalitat de Catalunya (the medieval parliament of Aragón-Catalonia) with certain provisional powers in health, education, and public works. More important, the Generalitat was to prepare terms of autonomy, which would then be put to public referendum in Catalonia before being presented to the Spanish Cortes (Parliament) in Madrid for ratification. Macia’s unilateral declaration of a Catalan state on the very day that the Second Republic was declared was premature, but it signalled the haste with which Catalanistas wanted their aspirations resolved. On June 10, 1931, the Generalitat met in the Monastery of the Pyrenean valley of Nuria to draw up a draft statute to present to the Cortes. Within 10 days, the draft was ready. Quickly it was passed by municipal councils and then overwhelmingly by popular plebiscite. By August 14, Macia was on the train to Madrid. The draft now required the approval of the Cortes (the Spanish Parliament), but here the impatience of the Catalans ran up against the opposition of centrist sentiment, which felt that the draft provisions went too far. The new Constitution, finally proclaimed on December 9th, 1931, did not clarify matters. Article 1 recognised the right to regional autonomy within a vaguely described “integrated state” but offered no further guidance. As a result, endless amendments and separate motions –which had begun in August 1931– dragged out the debate for a year before an attempted coup by the Spanish army in August 1932, and the determination of the prime minister, Manuel Azaña, finally brought the Catalan question to a successful conclusion. In September, 1932, Catalonia’s Estatuto de autonomia was passed by the Cortes. Nevertheless, the Estatuto de autonomía saw the Nuria draft stripped of potentially subversive references to the right to self determination, Catalan citizenship, Catalan as the only official language, and the right to territorial enlargement etc. Rejected too were Catalonia’s exclusive power over education and equal legal representation to resolve conflicts between the central government in Madrid and the Generalitat. Furthermore, the Statute permitted the central government the right to unilaterally intervene in Catalan affairs. What was left for the Generalitat to control? It enjoyed a largely independent tax system, and jurisdiction over health and welfare within the community. Nationalist sentiment was also satisfied somewhat with the recognition of a Catalan flag and anthem, but the Catalan language still had to share official status with Castilian. Nevertheless, finally having a Statute of Autonomy was enough to make Catalonia one of the Republic’s staunchest supporters. Colomines i Companys, Agustí “Representing Catalan National Identity. Catalonia during the Spanish Second Republic and the Civil War,” in Journal of Catalan Studies, 2008, pp. 65-85.